Smoke and water damage from fires, floods, sump pump failure, and frozen pipes can damage your home and ruin your furniture and other belongings. When these unfortunate incidents occur, you need a company with the expertise, experience, and equipment to prevent further damage and to restore your home and furnishings to pre-disaster condition. J&S Steamway has been providing Anchorage, Alaska and surrounding areas with the best fire, flood, and water damage restoration services for nearly 40 years. J&S brings the right equipment and skills to the rescue. When disaster hits, call us quickly and we’ll help you avoid bigger problems that occur quickly. 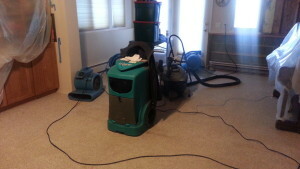 Mold: Mold spores begin to form within 48 hours of the initial water damage. Damage to drywall and ceiling tiles: Moisture from evaporating water seeps into and behind drywall, ceiling tiles, and flooring, causing it to sag, crack, and separate from its underlying framework. Furniture damage: Moisture gets into furniture, providing the ideal habitat for mold, mildew, and fungi. Damage to books, photographs, and other paper products: Surrounding moisture ruins irreplaceable items in your home. Quickly remove standing water. Using powerful pumps, we remove standing water from inside, under, and around your home to prevent further damage. Disinfect and deodorize. Our environmentally safe disinfectants and deodorizers prevent the growth of mold, mildew, and fungi, while removing unpleasant odors. Dehumidify. Using industrial-strength dryers, we extract moisture from the air before it has a chance to seep into and behind walls, floors, and ceilings. Restore your home and furnishings to pre-disaster condition. We inspect the damage and help you decide what to restore and replace. We restore any salvageable belongings to their pre-disaster condition.